In the near future, antibiotics have lost their effectiveness, traditional agriculture has been taken over by genetic modification, and medicine has advanced to Frankenstein levels. 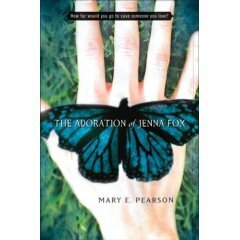 Yet teenagers are still teenagers and Jenna, having woken a two-year coma after an accident, is searching for the meaning of her life. Her searches bring her far more than she could have expected and soon Jenna must confront questions about parental love gone amok, the meaning of the soul, and what quality of life truly means. While bearing a superficial resemblance to Haddix's novel, Double Identity, this is a very different novel, and one which is far removed from Pearson's over-lauded A Room on Lorelei Street. The writing can get a bit turgid at times, but there are some fascinating themes raised here (warning: mandatory book review assignment material!). I'd recommend this book simply to give you a chance to read one of the more fascinatingly original YA novels written this year.